HP's ProLiant DL120 Gen9 delivers dense performance and affordability in a 1U, single socket system. Powered by Intel Xeon processor E5-2600 v3 processors, is ideal for SMB customers running virtualization or general purpose workloads. 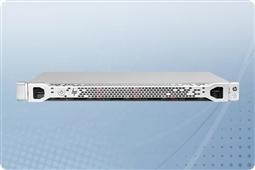 The DL120 Gen9 server helps reduce virtualization licensing costs with its single cpu optimized design. Two different chassis options support up to four 3.5" or eight 2.5" 12 Gb/s SAS, SATA, or solid state drives. Additional features of the the DL120 Gen9 include flexible networking options, energy efficiency, and improved temperature control. For a peak combination of entry level performance, efficiency, and affordability, please browse our DL120 Gen9 servers today! Aventis Systems carries New HP ProLiant DL120 G9 servers. All servers from Aventis System include a 3 year Comprehensive Warranty, with eligibility for optional Express warranties and onsite services.